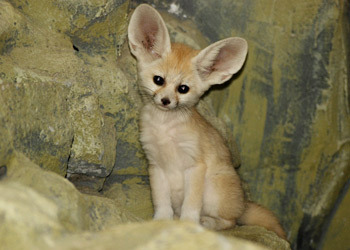 The fennec fox (Fennecus zerda), a native of northern Africa, has moved to much colder climes – or at least one litter has. A litter of fennec pups and their mother have taken up residency in the Krakow Zoo‘s nocturnal creature pavilion. They were born on 13 June, and were initially kept away from visitors so that the family could settle in. The tiny foxes, the world’s smallest species, are particularly known for their giant ears, which can measure around 15 cm, or more than half the foxes’ body length, and are used to radiate body heat in the hot Saharan Desert. As nocturnal creatures, they sleep through the hottest parts of the desert day and hunt at night – though in Poland, that should be much less of a problem.